THE STORY - Recently released from prison, a gang member finds himself forced by his leaders to orchestrate a major crime with a rival gang. THE GOOD - Good pacing that constantly keeps the action and the drama moving. Nikolaj Coster-Waldau gives it his all in a powerfully reserved performance. THE BAD - Comparisons to other forms of entertainment ("Breaking Bad" "The Night Of") that told this kind of a story better due to their longer forms of storytelling are unavoidable and unfortunate. ​You don’t ever really get out of prison. It is a never ending hell that is constantly reminding you, constantly punishing you, for the mistakes you have made. Unfortunately for Ric Roman Waugh’s film (His follow-up to the Dwayne Johnson film “Snitch”), “Shot Caller” does not do the best job in terms of balancing one man’s pre prison life with his emergence and dominance within the system. The film utilizes two timelines to cut back and forth between Harlen’s introduction and rise through the prison system and his first few days out on parole to try and show a contrast in just how different he is as a man and what he has had to become in order to survive. It’s a good system for this form of storytelling but the balance is off, thus rendering it less powerful despite a magnetic lead turn from Nikolaj Coster-Waldau. Jacob Harlen (Nikolaj Coster-Waldau) is a stock broker with a beautiful wife (Lake Bell), a son and an all round envious life. After a fatal car accident takes place, one which he is held responsible for, he takes a plea deal and is sentenced to 16 months in prison. Due to the nature of the accident being violent, Harlen is being locked away with other violent criminals and as a result, must do whatever he can to survive within the prison’s infrastructure and hierarchy. As months turn into years, Harlen becomes less and less like the man he was when he first arrived and slowly turns into a dangerous criminal himself. When his time is up and he is free to move back into society, Harlen believes that his life may go back to normal until he finds out that the ties he formed to stay alive in prison, will not let him go so easily. Harlen, aka. “Money” is doing everything he can to not only stay alive but to keep his family alive as well. That is where the emotional core of the film is. It relies on us getting behind a man trying to stay alive and protect the ones he loves but at what cost? The film opens up with Harlen writing a goodbye letter to his son Joshua from inside his prison cell. He knows that his relationship with his son and wife is over, however, if he can keep them safe from the other inmates inside who would use their resources on the outside to bring them harm, then it will have all been worth it. In many ways, “Shot Caller” is a mixture of “Breaking Bad” meets “The Night Of,” however it never gets to a point where it is as nearly compelling as those two films. Nikolaj Coster-Waldau gives a quietly reserved performance that is quite powerful at times and brought down at others due to his fleeting accent (The man is Danish). 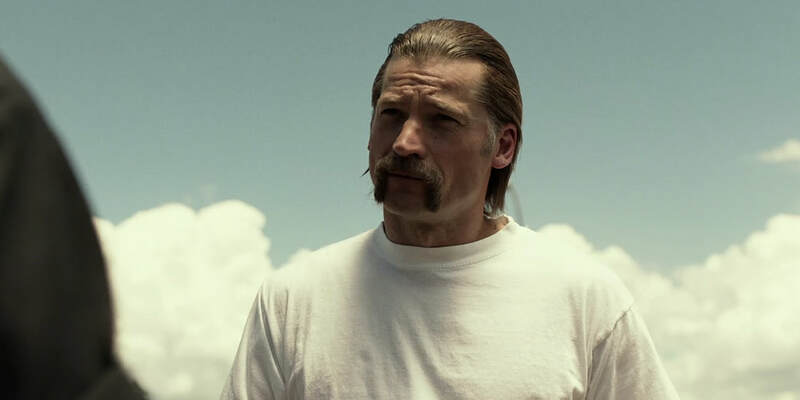 Despite his best efforts, there was never a time where I forgot who this man really is (Best known for playing Jaime Lannister on “Game Of Thrones”) and though his transformation from ordinary citizen into hardened criminal is striking in both his performance and look, there is still something about it that feels awkward and rushed. Jon Bernthal plays a criminal that Harlen befriends in prison and has a tough time trusting once he is on the outside while Omari Hardwick plays the cop who is trying to bring down the gang that is running a criminal empire from within the prison system. No performance in the movie stands up to Waldau and what he is doing. Everyone else has their role and they do it as well as they can but this is Waldau’s show. Even though Waldau’s performance is somewhat damaged by the film’s quick pacing, I do have to commend director/writer Ric Roman Waugh for always keeping the film engaging despite its faults. I have little doubt that had “Shot Caller” been made into a TV mini series instead of a two-hour feature length film, it would have benefited greatly from the extra runtime. Unfortunately, that decision would have led to too many comparisons between this movie and the before mentioned television shows. No matter how you tell this story, “Shot Caller” has the unfortunate task of being inevitably compared to other stories which have come too recently before. Had the movie been released first, I’m sure it would be garnering more praise. As it is, it’s not the worst and it’s not the best movie I’ve seen all year. It’s an adequate and gripping movie in its own right that is average at best.